Card Captor Sakura is a fun, action packed series aimed at young viewers (mid-elementary especially) and is suitable for all ages. The main character Sakura is a cute, although a touch clue-less, girl who has been unwittingly forced into the role of Card Captor. Much of Sakura's character, as well as that of her brother, is very like children growing up in a family with plenty of teasing, conflict, and of course love. The story in this first episode was concentrating on introducing the characters to the viewers and trying to build the story as much as possible. While not particularly deep, the story flows smoothly and builds a fairly clear initial image of Sakura (your usual Grade 4 kid who has a crush on certain teachers and older boys) as well as Cerberus (an Osaka-ben speaking winged creature who loves to eat). The question will arise later to what extent will the series rely solely on the idea of finding the cards and returning them to card form. Or whether there be a more substantial story hidden beneath the initial concept - Clamp stories are often much less simple than first perceived. The animation itself is a touch weaker than usual TV quality animation with lots of empty backgrounds, unmoving backgrounds and "cotton candy" blooming cherry trees. However, given then intended viewer audience, I sincerely doubt that major budgets are available for the more highly detailed and smoother scrolling animation quality expected in adult or older audience targeted films. Also, the animation itself is more than adequately detailed to portray the story although there's definite use of more basic drawing styles to portray certain emotions as well. The music provides a good accompaniment to the story, never being overly obvious nor completely absent but definitely helps to set the tone; bright and sprightly or a touch darker and more mystical. Time will tell how much of it is constantly recycled throughout the series, however again this is not OAV material, but kids TV. The voice acting for the first episode is good given that the voice actors themselves are learning their roles and characters. 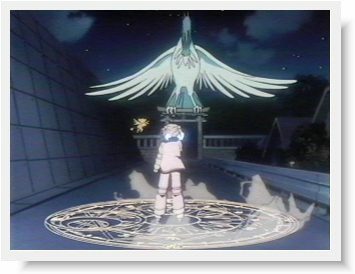 We see in Sakura, an uncertainty in using the magic key given to her by Cerberus let alone confronting on of the Clow cards. Cerberus is solidly portrayed as being a touch over-confident and annoying creature who may well get Sakura into a fair amount of trouble; time will tell. While currently only available in the original format, when it does become available to the general market, it should not offend viewers due to any unsuitable content. Card Captor Sakura is currently showing on TV in Japan on NHK Education.